We are happy to announce that our family of deer have grown this spring by six fawns that we know of so far! We believe there are still a couple expecting moms! Last year we were lucky to welcome seven new young ones to the herd. A herd of roughly 30+ white-tailed deer call our wildlife sanctuary home, just as their relatives have for nearly 90 years. The white-tail are medium-sized deer native to the United States, Canada, Mexico, Central America, and South America. The group that stay in and around Tomhegan are unusually tame as there has been no hunting allowed in the area since it was established as a State Game Preserve in the 1930’s. Every year, generally in June, our pregnant does birth one, two and although rare, sometimes three spotted young weighing from 4 to 8 pounds. The sweet little fawns are born with beautiful white spots that begin to fade over the summer months and weigh between 44 to 77 lb by their first winter. Fawns spend most of the first four or five weeks, bedded down in the grass while, unique to our location, their mothers will visit guests and eat at our trough twice a day. If you happen to see a fawn laying alone, please leave it be as the mother will return once she is done feeding.The fawns generally remain very shy for the majority of the summer, yet they begin to follow their mothers to the troughs and cabins by late July. Fawns are usually weaned after 8–10 weeks, but on occasion a fawn will continue to nurse long after their spots have faded. (for several months, or until the end of fall). All white-tailed deer are capable of producing audible noises unique to each animal. Fawns release a high-pitched squeal, known as a bleat, to call their mothers. If you visit Tomhegan in the spring or summer months, listen for these sweet sounds. 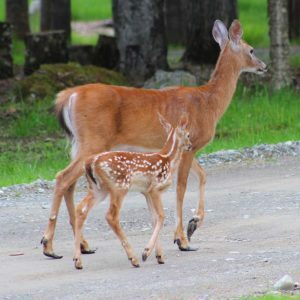 This bleat deepens as the fawn grows until it becomes the grunt of the mature deer, a guttural sound that attracts the attention of other deer in the area. A doe makes maternal grunts when searching for her fawns. Our does also grunt to announce meal time at the trough to the rest of the herd. Bucks grunt, at a pitch lower than that of the doe; this grunt deepens as the buck matures. Both does and bucks also snort, a sound that often signals an imminent threat. Mature bucks also produce a grunt-snort-wheeze pattern, unique to each animal, that asserts its dominance, aggression, and hostility. Although it is rare to see a mature buck here at camp, when you hear any of our deer making grunt or snort like sounds, please respect their space. White-tails also communicate with their tails. When spooked, they will raise their tail to warn other deer in the immediate area. 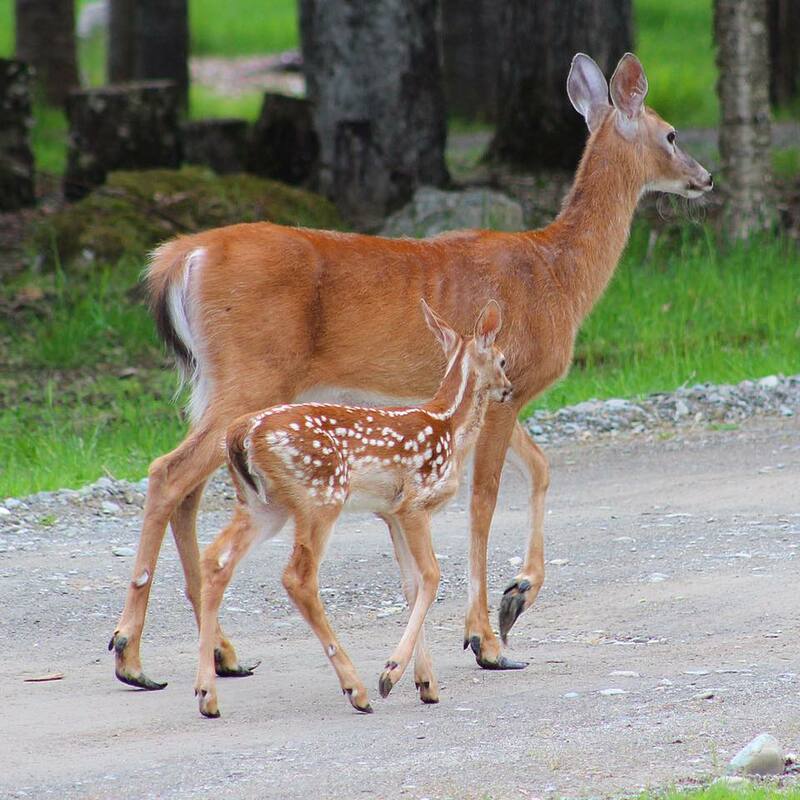 Guests at Tomhegan often ask how to tell male and female fawns apart. There are a couple of subtle differences to look for. Male fawns tend to be slightly larger and heavier than females and young males have dark circles where their antlers will eventually grow sometime around their first birthday. Many of the young bucks here at Tomhegan don’t come around after the first year, but join small groups of other bucks. The does come back year after year. We feed the deer at a trough near the office twice a day. In the summer months “breakfast” is usually around 7:30AM and “dinner” is around 4:30PM. We invite guests to watch, yet ask that you give them their space while eating. If you offer them grain, fruits or vegetables, you may be treated to a close encounter that you won’t soon forget. We make it a point, and ask our guests also, to respect the space of the newborn fawns. Please let them find their own way and keep a safe distance as they are easily frightened. The wildlife is a huge part of what makes Tomhegan so special. Stay with us for your next vacation and leave with a lifetime of memories.